Las Vegas is home to dozens of the world’s best restaurants. We’re talking Michelin stars, James Beard Awards and AAA Five Diamond certification. We also have restaurants from pretty much every celebrity chef under the sun from Gordon Ramsay to Guy Fieri. The Krug’s Chef’s Table at Restaurant Guy Savoy. Photo courtesy of Caesars Palace. Acclaimed French chef Guy Savoy emulates the menu of his Paris restaurant here at Caesars Palace. Any dinner in the restaurant is fabulous, but if you want a really over-the-top experience there are a couple of options. If you’re a Champagne lover (and who isn’t?) you can enjoy the only Krug’s Chef’s Table in the U.S. The cost is $500 per person for two to six guests. You’ll sit at the six-seat chef’s table with a view of the kitchen while enjoying a tasting menu paired with Krug’s cuvée Champagnes. 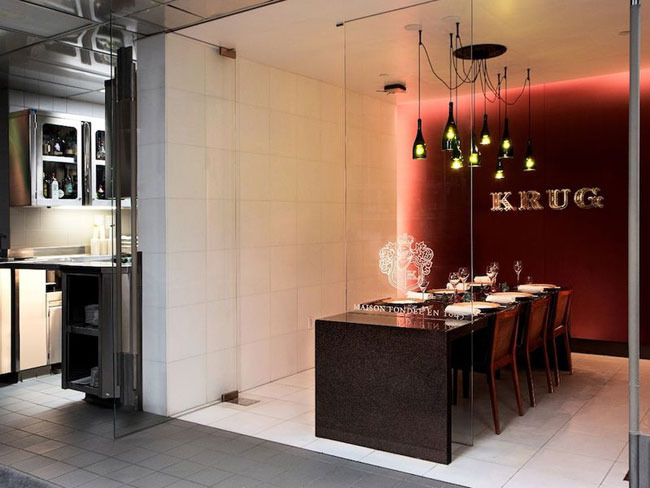 The 10-course meal will be prepared on the spot and paired with two glasses of Krug. In honor of its Forbes Five-Star rating, Restaurant Guy Savoy also has a Forbes 5-Star Celebration Menu for $555 per person, which includes a premium wine pairing. The five courses include: lobster, golden Osetra caviar and spring vegetables; poached wild Atlantic turbot, fennel and sea urchin; artichoke and black truffle soup, toasted mushroom brioche and black truffle butter; grilled A5 Japanese Wagyu, morels, asparagus, fava beans and black garlic; and a chocolate and tangerine dessert. 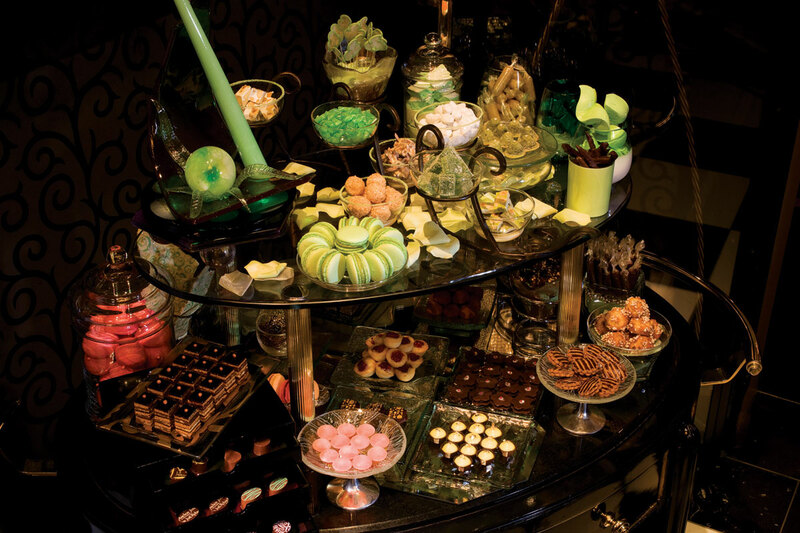 The mignardise cart at Joël Robuchon, photo courtesy of MGM Grand. There’s only one place in the United States where you can enjoy fine French food from Joël Robuchon and that’s in Las Vegas at MGM Grand. His three Michelin-star restaurant serves an incredible 16-course tasting menu. It’ll set you back upwards of $400 but hey, this guy has been called the “Chef of the Century” so you know the food will be incredible. The menu can change seasonally but dishes you may find yourself indulging in include Maine lobster; foie gras with black truffles; black truffle tart with confit onions and smoked bacon; sea urchin; black cod; beef chateaubriand; seared diver sea scallops served with caviar; and much more. Your meal is also accompanied by dozens of bread varieties from the restaurant’s bread cart and a seemingly endless supply of bite-size desserts from the mignardise cart. 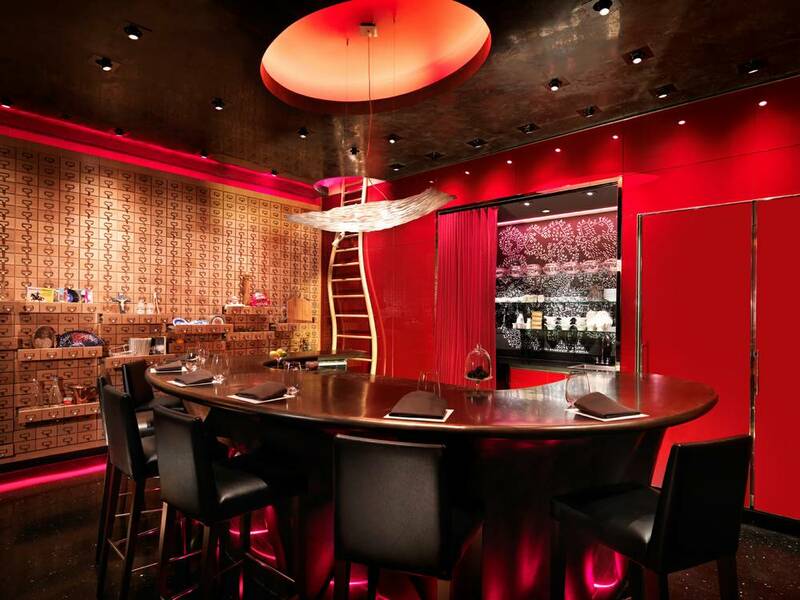 é by José Andrés, photo courtesy of Las Vegas Weekly. Remember how the only way you could get into Willy Wonka’s chocolate factory was with a golden ticket? Well it’s the same at é by José Andrés. You have to e-mail for a reservation months in advance to get into this exclusive dining experience and if you get in you’ll receive a golden ticket in the mail. If you’re a lucky ticket holder, you’ll be seated in a private room adjacent to Andrés’ other restaurant, Jaleo, inside The Cosmopolitan of Las Vegas. There’s one table that seats eight and you’ll be treated to a 20+-course tasting menu, which costs around $200 per person plus extra for alcohol pairings. The cuisine is avant-garde Spanish and while the menu is a surprise you might get to try items like cotton candy empanadas, beet gazpacho, Iberico chickpeas, Spanish pizza, foie doughnut, smoked oysters and cava sangria jelly. Twist, photo courtesy of Mandarin Oriental. 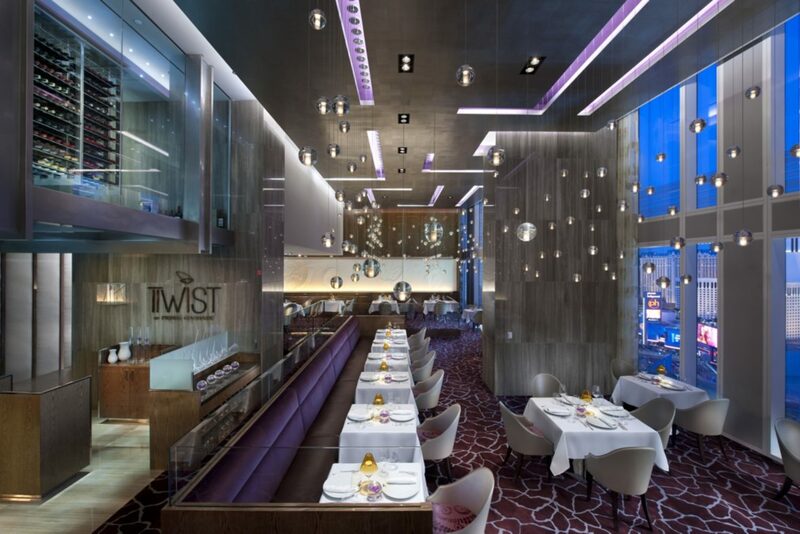 Twist is the only place in the U.S. where you can taste the cuisine of French chef Pierre Gagnaire. The restaurant, located at Mandarin Oriental, recently received the Forbes Five Star award for 2016. Wine lovers looking for a bucket list meal will definitely want to try the Lucky Number 7 tasting menu. The menu was designed with the wine in mind first and then the food was chosen to accompany the wine. The seven-course menu is $777. We can’t tell you what’s on the menu because it’s always a surprise but we can tell you that some of the wines you might be drinking include Didier Dagueneau, Château Haut-Brion, Angelo Gaja, Château Leoville Las Cases, Château d’Yquem, Kongsgaard “The Judge” Chardonnay and Domaine Huet Vouvray. 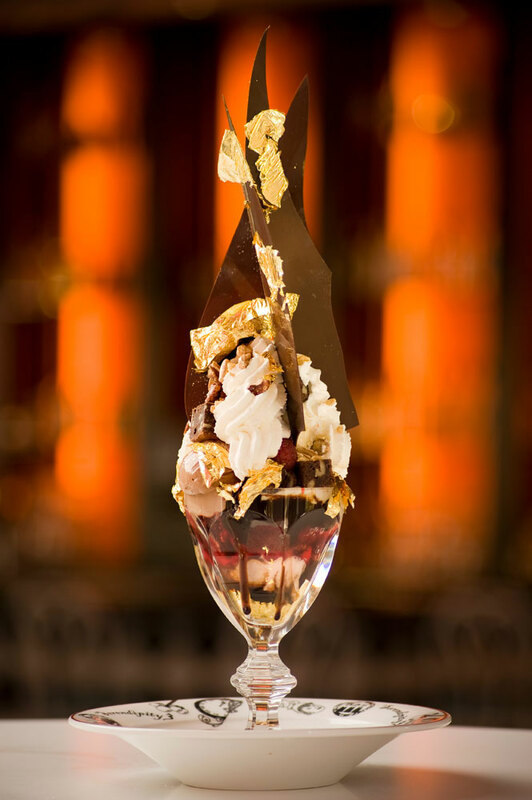 The Golden Opulence Sundae, photo courtesy of Caesars Palace. We have lots of fancy-schmancy desserts in Vegas, but the Golden Opulence Sundae at Serendipity 3 takes the cake. It holds the Guinness World Record as the most expensive sundae at $1,000. Here’s why: It’s covered in a 23 karat edible gold leaf and made from Tahitian vanilla bean ice cream infused with Madagascar vanilla. The chocolate syrup is from one of the world’s most expensive chocolates. It’s covered in chunks of rare Chuao chocolate and adorned with exotic candied fruits from Paris, gold covered almonds, and chocolate truffles. It also comes with a tiny bowl of Grand Passion Caviar – a dessert caviar infused with passion fruit, orange and Armagnac. The $777 burger, photo courtesy of Paris Las Vegas. In Vegas, we can make anything — even a burger — fancy. Burger Brasserie sells a $777 burger. What makes it worth the money? It’s made with Kobe beef, pancetta, goat cheese, seared foie gras, arugula, Maine lobster and 100-year-aged balsamic. 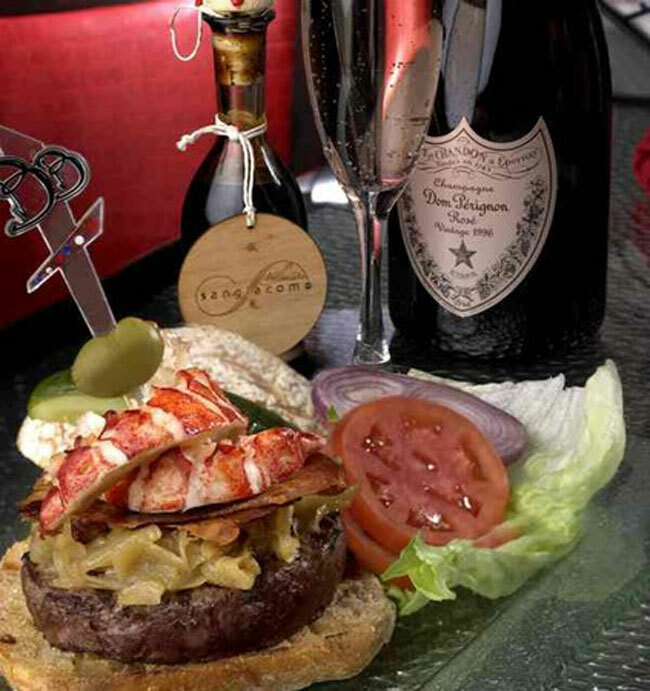 Oh – and the burger also comes with a bottle of Dom Perignon Rosé Champagne.